The London Cabaret Club’s dazzling, 007-Bond themed Valentine’s special ‘Love Never Dies’ on Saturday night, in the Art Deco Bloomsbury Ballroom, was a spectacular live cabaret show and fine dining experience. 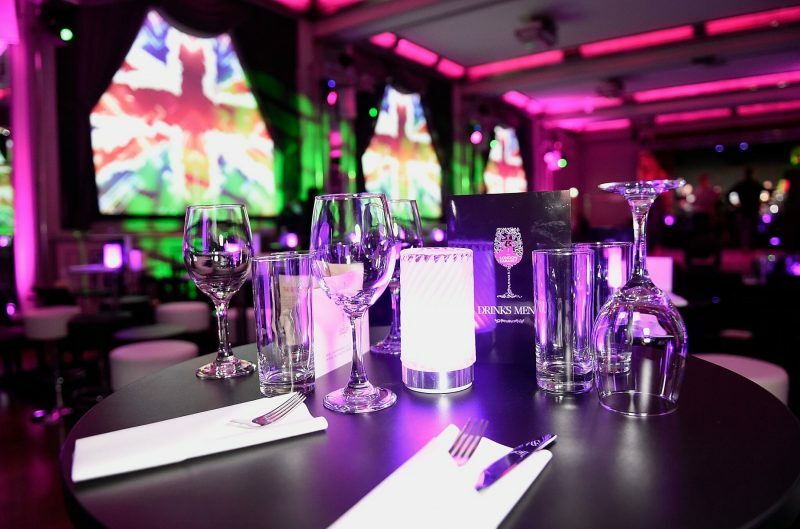 The cabaret show was a special preview of the upcoming (February 18th) ‘London Never Dies 2017’ show, featuring fine dining, bespoke drinks, Bond-inspired cocktails, a stunning cabaret show, music, acrobats, dancers, live band and ground breaking 4D special effects. Upon arrival at The London Cabaret Club, now in its permanent residence at The Bloomsbury Ballroom, we were greeted by John Murphy, club manager, who escorted us downstairs into the bar area. We enjoyed pre-show Bond-inspired cocktails and were seated in front of two male singers, who serenaded guests with Valentine’s Day style romantic ballads. A hostess wearing a Union Jack (Spice Girl style) sequin dress, handed us an exclusive Bond-inspired ‘Top Secret’ mini file and red rose, which we were asked to read before we were shown to our table. Inside the file were cards with James Bond quotes from movies – From Russia With Love, You Only Live Twice, The Spy Who Loved Me and License To Kill. The Valentine’s Day special Bond-inspired Cabaret show featured various acts with stars from London’s West-End and original choreography, singers and dancers, plus a live band who entertained guests with romantic and espionage themes, in a stunning, 4D-sensory experience. Performing waiters somersaulted to serve Smoking Martinis, while Bond-girl style costumes oozing glitz and glamour were designed by fashion icons Suzanne Clements and Inacio Ribeiro. Designer Tom Sutherland’s impressive show lighting wowed, with the entire revolutionary cabaret concept was a creation courtesy of Evelina Girling and Doni Fierro. With three ticket options available to guests, the ‘VIP’ tickets (£125) include premier seating, exquisite British Tapas menu, VIP service, meet and greet with the cast of the show and reserved seating in the bar before and after the show, plus a copy of the London Cabaret Club souvenir programme. Guests could also opt for Champagne with aphrodisiac oysters and caviar on the menu. The exclusive wine list included bottles of 2012 Puligny Montrachet Ier Cru Les Perriers, Jean Louis Chavy (£120) and Chateau Grand Puy Ducasse 5Eme Cru Classe 2006 (£165). We thoroughly enjoyed the outstanding ‘Show and Dinner’ tickets (£75) which included a sumptuous three-course meal and table service. I was there with my friend Neil, and we enjoyed the ‘Spector’s Smoked Salmon’ on large blini with dill and capers, along with Casino crab cake with crab salad. The main course was the ‘Live and Let Die Guinea Fowl’, roast breast of guinea fowl with butternut squash purée, romanesco and beetroot crisps. Dessert was the ‘Miss Moneypenny’ Black Forest gateaux, chocolate disc, vanilla ice cream and chocolate sauce. Also available is a ‘Show only ticket’ (£35) where guests can watch the show sipping on the bespoke cocktails or choose from the exclusive drinks, champagne and wine list. The Luxuria Lifestyle March Hit List!